Before 2012 ended, I was lucky to have won a gift certificate from Corner Tree Cafe by being the 3,000th liker of their Facebook page. Being someone who doesn't really have good luck, I was really surprised yet very grateful at the same time. 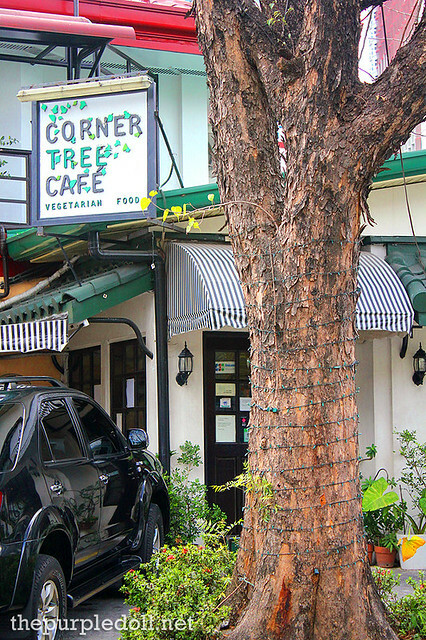 You see, the reason I looked up Corner Tree Cafe on Facebook was the fact that this vegetarian restaurant won the Best Specialty Cuisine in Manila’s Best Kept Restaurant Secrets for 2012. 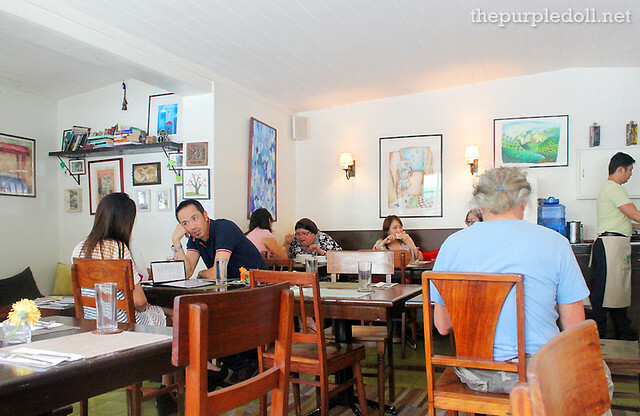 It wasn't until last month though that the beau and I found ourselves inside the dining space of the award-winning Corner Tree Cafe in Jupiter Street, Makati. Prior to visiting, I've already pictured the restaurant to be cozy and laid back. I wasn't expecting that it would literally feel like home though. While the area is small with tables a little too close to each other, I felt that it fits with the whole neighborhood cafe theme. 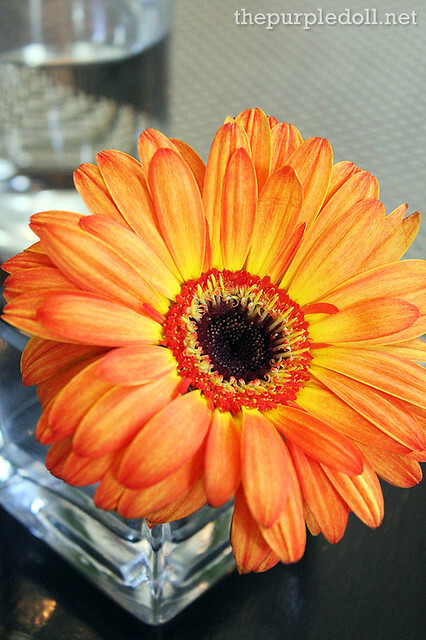 The place felt intimate yet refreshing, and we easily found ourselves at ease at the window-side table. Although I really dig the ambiance of the place as well as how witty its name is, the beau and I were still more excited to try out their food. Neither of us is a vegan nor a vegetarian, but being recently conscious with what we eat, we were psyched to find out for ourselves if Corner Tree Cafe serves healthy meals without sacrificing flavor. And to start off our lunch, we had the Vegetable Dumplings (P150), a new offering at Corner Tree Cafe's menu that comes with five bundles of goodness stuffed with shiitake mushrooms, spinach, carrots and singakamas (jicama), and served with a rice vinegar dipping sauce on the side. 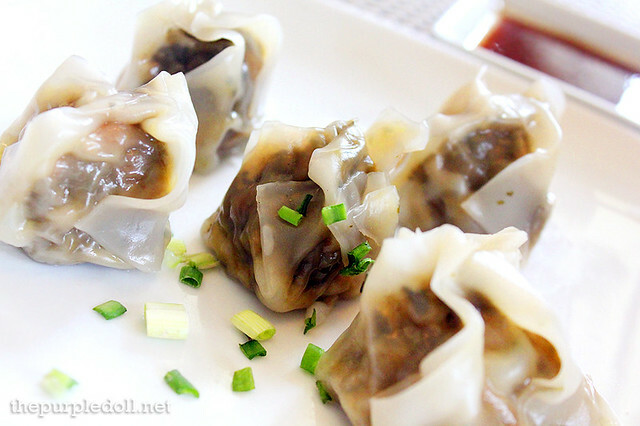 While both the beau and I are serious meat lovers, we can't deny that we fell in love with these Vegetable Dumplings. The filling was delicately savory, encased in a soft yet chewy wrapper. Seriously, this is one of the best dumplings I've ever had and I can't believe this is completely vegetarian! Now, I wish I had three orders of this though. For mains, I got the Spaghettini with Broccoli and Toasted Nuts (P325) (almonds or pine nuts) topped with Parmesan cheese. When this plate was brought to our table, I felt excited yet a little disappointed as well. For the price, the serving was quite small for a heavy eater like me. However, upon tasting it, it was better than I expected. Despite having simple ingredients, the dish was tasty, with varied textures, and healthy at that. Even the beau who isn't a big fan of broccoli enjoyed his few forkfuls from my plate. 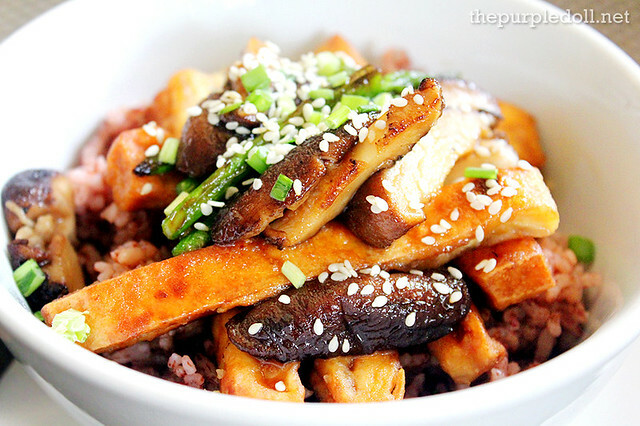 The beau had Tofu Teriyaki with Sauteed Asparagus & Shiitake Mushrooms (P280) which is a vegan dish served over organic red rice. Compared to my order, this rice bowl is an explosion of stronger flavors. Even if I'm not crazy for tofu, I can't get enough of the tofu teriyaki. It was just so savory and simply delish! The veggies were cooked perfectly too and came coated with the same flavorful teriyaki sauce. Everything in this bowl was so scrumptious that I think I got spoonfuls from the beau's order more than I should've. For dessert, we had the Salted Caramel Chocolate Torte (P160), a serving of rich and sinful layers of crust, salted caramel and chocolate mousse. While both the beau and I are fans of this type of dessert, we were unprepared for how rich the salted caramel tastes. Really, it's the most intensely-flavored salted caramel mixture I've had. Good thing the chocolate mousse and crust counteract its richness making every forkful very enjoyable. So surely, this is a dessert even more perfect for salted caramel lovers. Since it was quite a hot afternoon that day, I got myself a glass of their home-brewed Organic Lemongrass Iced Tea (P90) which I loved. It was refreshing with subtle lemongrass flavor and sweetened with natural muscovado sugar. 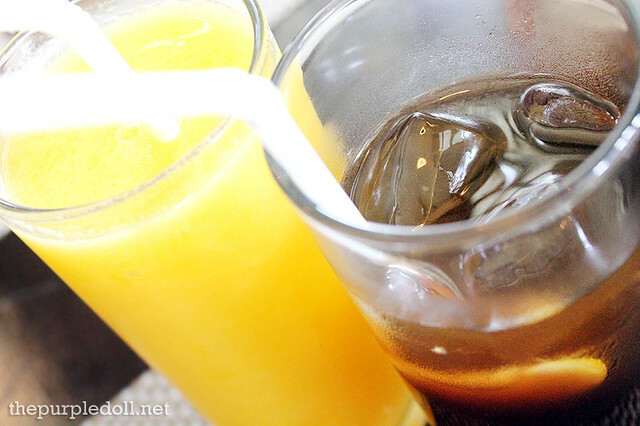 The very safe-playing beau on the other hand, had Fresh Mango Shake (P120) sweetened with honey. After an afternoon at Corner Tree Cafe, I think I've fallen in love with healthy-eating even more. I may not be capable of fully converting into a vegan or even a vegetarian, but I'll surely try to eat more healthy dishes especially if they're as good as what Corner Tree Cafe offers. And with a refreshing, laid-back ambiance coupled with prompt & courteous service, meat eater or not, I'm very positive that this homey cafe will satisfy. So Corner Tree Cafe, thank you for inspiring me to eat & live healthier. See you again soon! I really love to try their menu. Thanks for this wonderful blog. Wow! 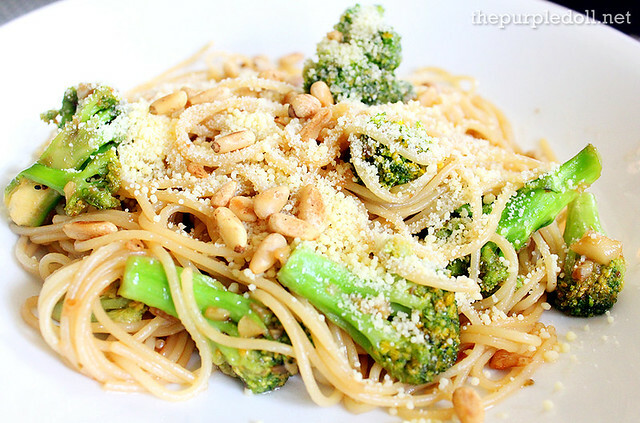 I wanna try the Spaghettini with Broccoli and Toasted Nuts looks tasty and yummy... and all foods are healthy! Great place judging from the photos :) Would love to try the dumplings! I'm no vegan too but I'm craving for all of them especially the Spaghettini with Broccoli and Toasted Nuts and Tofu Teriyaki with Sauteed Asparagus & Shiitake Mushrooms. I'm actually surprise at the size of the place from your photo. I thought it was just a small restaurant from how you see it in Jupiter side. They do have great and healthy foods alternatives. OMG! A veg resto in Makati...Will definitely visit this place and I'm hoping to try their meals. Perfect for me...as a vegan! Will tell Carl about this. I think it is expensive, but hey it is on Jupiter! We go to another vegan place nearer us here, and the price is comparable. That cake looks great! Oh i love the cake! wanna try it! I love vegetables and I like to try Vegetable Dumplings and Salted Caramel Chocolate Torte in your post. I could probably swing by that place, since I don't live so far from Jupiter. I'm a huge fan of tofu, by the way :). Oh, and the cake looks so sinfully yummy! That salted caramel torte is salivating for new customers. But sure it looks decadent. My husband and I are meat lovers too.We need to try this because our 2013 should be a Healthy one. Your post makes me want to go there and try their Vegetable Dumplings and Salted Caramel Chocolate Torte. Yum! I've been hearing so much about this place but I'm still quite skeptical when it comes to all veggie food. But thanks to your post I think I'll give it a try. Thanks again! Wow, im craving for the Salted Caramael Chocolate Torte and Dumplings. Thanks for this post. Thanks for the nice review! :) I've been wanting to go there since I saw it on TV. Hope to go there soon! 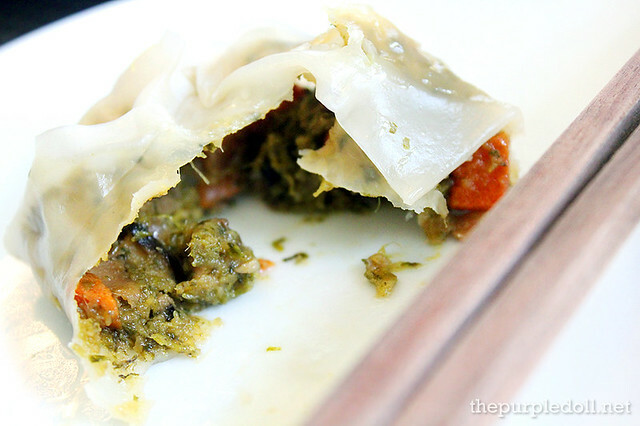 I'm not really a veggie lover, but I would love to try this especially the vegetable dumplings! I have been working in Makati for 4 years now and I have seen this restaurant several times. I haven't eaten here yet though. Thanks to your blog entry I think I will make it a point to visit them soon.